Day Four of my virtual blog tour and I'm at Bunnie's Review If you haven't already done so, please sign up for my newsletter. You'll receive a free PDF copy of my contemporary romantic comedy "Rescue Me". I offer news of new releases, contests and special offers to subscribers and I promise I won't fill your inbox with tons of mail! Don't forget to comment on any of the stops on the blog tour for your chance to win a $20 Amazon gift certificate! Day Three of my Virtual Blog Tour! I'm at two stops again today on day three of my whirlwind tour of the Internet! First stop: I'm visiting Tyhada Reads. Second stop: Harlie's Books. Two fun interviews today. Please remember to leave a comment at any of the stops on this week's tour for a chance to win a $20 Amazon gift certificate. As well, sign up for my newsletter and receive a free PDF copy of my contemporary romantic comedy "Rescue Me". 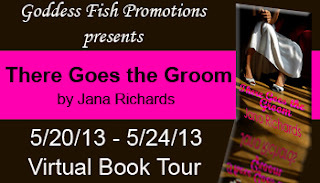 For my first stop today I'm at Long & Short reviews on my virtual blog tour. Olivia Taylor, my heroine from "There Goes the Groom" gets on the couch for an interview with her shrink. She's having a tough time! My second stop of the day is at Flirting with Romance for a fun interview. Please stop by! Remember, all comments on my blog tour are eligible to win a $20 Amazon gift certificate, so please stop by and say hello! Tune in tomorrow to find out where I'll be next. See you then! First Stop on my Virtual Tour! 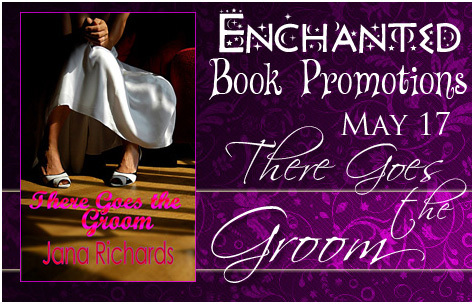 Today begins my new blog tour to celebrate the release of "There Goes the Groom" on Friday, May 17. 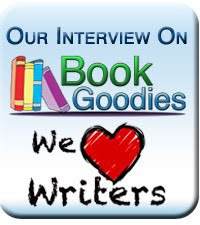 I'm at the Straight From the Library blog for a fun interview about book habits. Yikes! See you there! 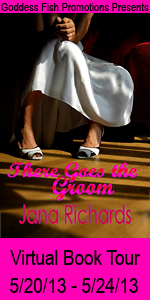 "There Goes the Groom" can be purchased from my publisher, Uncial Press. Enjoy! Tony helped Olivia load the dishwasher. When they lifted their heads at the same time, Tony touched her cheek. He gently rubbed at the spot with his thumb. 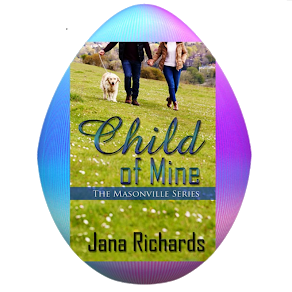 Olivia’s heart instantly began to race, her limbs turning to liquid at the tenderness of his touch. The shock of it kept her rooted to the spot. Tony must have felt it too. His dark eyes turned smoky with desire. He lowered his head towards hers and kissed her, at first softly, tentatively. Then his arms went around her and he brought her tight against him, their bodies melding together in remembered perfection. Olivia slid her arms around his neck, nestling even closer. Tony’s kiss became insistent, demanding, hungry. Olivia felt herself being swept away on a wave of passion. Nothing had felt so good in so long. The ringing of the phone brought her back to earth. She took a step away from Tony. What was she doing? She couldn’t do this again. She couldn’t let him leave her again. 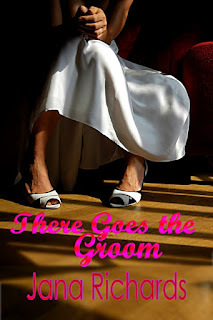 Release Party for "There Goes the Groom"
Please join me in celebrating the release today of my contemporary romance "There Goes the Groom". I'm so thrilled this book is finally here! 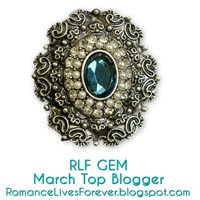 Participate at any of the blogs listed here for a chance win a $20 Amazon gift certificate. Let the party begin! Olivia slid to the floor as she got off her stool. Tony picked her up and carried her to the extra bedroom. She snuggled against his chest, still clutching her balloon. Tony’s heart overflowed with love for her. He laid her gently on the bed, covering her with the blankets. He couldn’t resist smoothing her hair from her face and kissing her cheek before leaving her. He wasn’t likely to ever forget. The question was, did he ignore his feelings and possibly let Olivia make the biggest mistake of her life, or did he come clean and let the chips fall where they may? I'm blogging for the first time today at the Contemporary Romance Cafe, a new group blog made up of authors from Carina Press. I'm talking about getting "The Call" from Carina Press, and how the sale of "First and Again", to be released October 7, 2013, came to be. To mark the opening of our new group blog, we will be giving away gift certificates through the month of May. It's easy and fun to enter, so please stop on by!